Dr. Haledjian had just ordered a drink at the bar in the Las Vegas motel when a lean young stranger with sun-bleached golden hair and tanned cheeks took the stool beside him. After asking for a gin and tonic, the sunburned young man nodded toward the gaming tables. "Name's Clive Vance," he said genially. "It's sure great to be back in civilization and hear money talking out loud." The famous sleuth introduced himself. "I take it ... See More you've been out on the desert?" "Got back yesterday," said Vance. "Washed the dust out of my ears, had a real live barber shave off seven months of whiskers and trim this mop of wheat. Then I bought a whole wardrobe on credit. All I had to show was my assay report. Boy, am I ever ready to celebrate." "Right you are. Hit pay dirt." Vance stroked his bronzed chin thoughtfully. He lowered his voice confidently. "Listen," he said. "If I can find a backer, I'll take enough out of those hills to buy ten pleasure palaces just like this one. "Of course," he added apologetically, "I'm not trying to interest you, doctor. Still, if you know somebody who'd like to get in on a sure thing, let me know. I'm staying in room 210. Can't give out details here, you understand." "I understand," said Haledjian, "that you'd better improve your story if you want to part some sucker from his money." What was wrong with Vance's story? 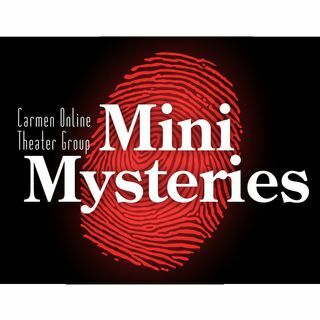 Email your answer to carmentheatergroup@gmail.com or on our forum, carmenonlinetheater.boards.net. We'll reveal the answer on Thursday after The Burbs at 10pm/ET. If you solved the mystery correctely, we'll say your name after the show.